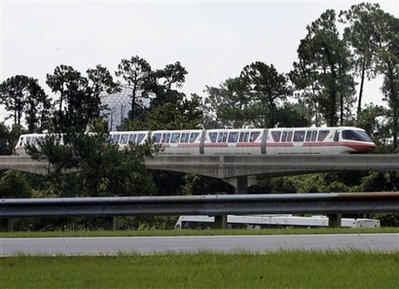 A monorail train sits motionless on a track outside EPCOT Sunday, July 5, 2009, at Walt Disney World in Orlando, Fla., after the park's monorail transit system was shut down after two monorail trains crashed early Sunday morning in the Magic Kingdom section of the park, killing one train's operator, emergency officials said. Disney said it was the first fatal crash in the monorail's 38-year history in the park. The transit system, which shuttles thousands of visitors around the sprawling resort each day, was shut down while authorities investigated the holiday weekend wreck.